If anyone else is (or in my case "was") a software engineer, they can appreciate this question. I'm building some software and it's far enough along that it is deliverable even as it sits. 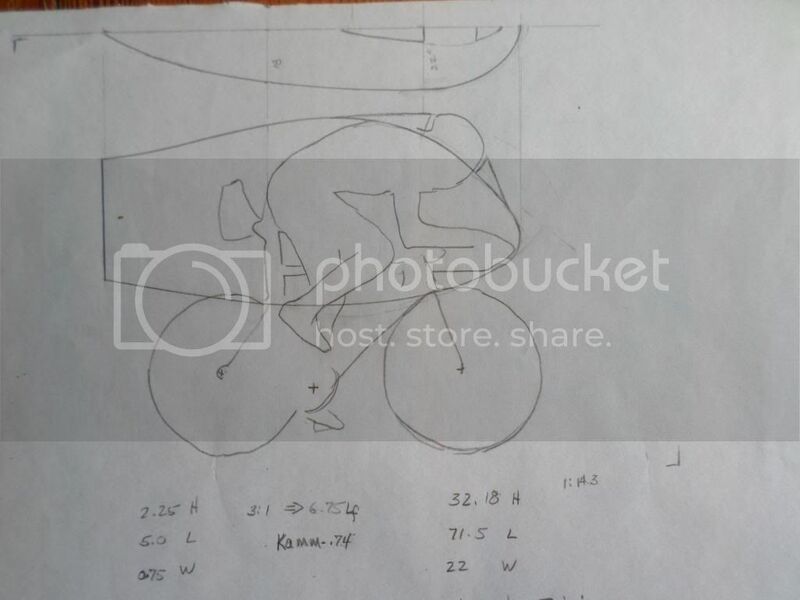 Regardless of the level of finish on it, I plan to give to recumbents.com. Haven't seen them serve up any msi files but no reason they couldn't I guess. The basic questions are "anybody interested?" and is there anything you'd like to see included, lest I've missed something obvious. At any rate, what it does right now is allow you to enter the frame dimensions, wheel locations (all measured from the nose, ground and centerline for z). It also includes a scalable rider that actually pedals. It then uses then NASA 4-digit airfoil formula to draw a semi-transparent shell (so you can see the rider) based on "tug points" you drag. You simply drag the points until the rider fits. Not done yet is at least a couple, possibly 3 outputs. My reason to create this was to draw "ribs" on multiple 8.5x11, paste them on plywood and use those shapes to craft a plug (a common technique). Warren asked if I could dump CNC files. The answer is yes and no. I could pretty easily dump the path for rib cutting but the pathing for the entire 3D shell would be far too complicated. However, that said, I have considered dumping .stl files which is one of the common mesh transfer protocols. .stl files are usable in several wind flow models and should be an import type for most CNC pathing software (it's basically mesh only, no color or texture overlays included). The more interest there is in the software, the kinder I'll try to make it. BTW, although I haven't dumped anything to craft yet, my shell playing always ends up looking amazingly like a Varna! Takes about 60 seconds to drag the stock starter shell into a pretty one. Yes, I'm interested. I have a shell that's close to fitting (thanks to Warren) that I'm modifying to fit me. I'd still like to see what a custom-designed shell would look like. I like that the rider is scalable- like Warren, I'm larger than 99% of the people out there. I'd love to print out paste-together patterns on a "normal" printer. Printing large-scale patterns (via Kinko's) is another option. FWIW: my wife is a former software engineer, too. I met her when she was with GM-Delco, she spent many years at H-P, and is still using her skills at the Patent Office. Are the parameters such that I could adapt this to an upright configuration? The rider would be rotated CCW 100 degrees and the hip angle varies with handlebar arrangement. An upright fairing covers from the shoulders to the knees. I'm working on getting a site to post this stuff on so you can at least get a visual of what it looks like. In the interim. First off this is a true 3D modeler although I only draw a half shell (one side). The rider is animated and reports his max/min knee bend as he completes full cycles. You can right-mouse drag the display around for any view although I locked the "z-rotation" which would be up/down hill so to speak. Above the picture are some standand form controls, checkboxes, radio buttons and sliders. The only reporting right now is the knee bends but there will be more soon. There are slider controls for seat height, tilt and leg adjustment with a readout for maximum knee bend (it actually measures this as the rider pedals). Rider box: This was probably one of the central design parameters I was after when I started this. "Rider box" is my term for that "fattest hula hoop" needed to encompass our shoulders and rump. I made this a tuggable region with four tug marks that allow you to position the rider box vertically, stretch it vertically and tug it to size at the shoulders and feet area. All points in between are Bezier curves (if you use a "drag curve" in paint, you'll be familiar). Not hooked up yet but coming soon are box tilt and slide. Never though about tilt until, playing with it, I realized that many low riders have very low rider->ground torso angles. A vertical box doesn't make a lot of sense for those, although it works it will make the shell thicker in places it doesn't need to be thick. as an example, a friend is exactly the same height as me yet we can't fit each others bike. His legs are 2 inches shorter, torso two inches longer then mine. My legs hit things inside his bike. His upper body is too long preventing the top from fitting. The foot length and ankle placement. Are all configurable. X factors are not BUT the rider isn't actually connected to the seat so a person can place the seat further from the hip joint to cover that detail. Since the seat is unlikely to be the limiting factor (part that pokes through the shell) it is irrelevant and can probably be omitted except for aesthetic purposes. Struggling to make an MSI for this. I merged Winforms and XNA together looking for the best of both. So far the MSI has been a bad dream... couple days of it and it'll be a nightmare. One would surely think I'll get there eventually. Oh and the angle of the foot. Actually the foot also "ankles" a bit (... mmm I think I left it ankling) but not much. That does matter and I should make it user configurable although (if still there) it's hard-coded atm. But I used a bunch of pictures and there wasn't much difference in foot angle for anything I measured (as best as that can be done anyway). Also the cleat placement is configurable. Mostly such things shift the rider box for and aft a whisker. Foot->Ankle was hard-coded at 100 degrees with 12 degrees of ankling. Both have been changed to User Inputs. Yes I am interested! Thank you for doing this and making it available here. You've probably hit upon one of the best groups of interested parties on the internet would be interested in using it. Many folks are builders on this website. Oh all-ya-all are welcome. Although I haven't contributed much, man life was so busy before I retired, I have perused the site often over the past 6 or 7 years and thought, "Man I'd like these guys!". So many have contributed so much. What an amazing community. Still working on the headaches of a delivery package. Not to "shop talk" too much about coding but, because I needed a robust user interface plus robust graphics I married two separate types of applications (XNA and Winforms) and MicroSoft <paraphrased> says, you might get it delivered but it's gonna be a PITA. They are right. Went ahead and purchased a domain name just so I could have a point of delivery for it. Hopefully you guys will be giving me some feedback on what to change by Christmas-ish. Not sure he can even provide it for download, the only things I've seen for downloads here are links to user sites but if can and will, I've given Warren a demo *.wmv file. My screen recorder, the free one from MicroSoft has pretty crummy resolution, this looks much better at the live app than the demo video. The video does show some of the things you do from the user end of it. What you are seeing at "tugpoints". Little blue tabs you select (by left-clicking) then hold the control key and left drag. Once you are hooked to a tug point, you don't have to have the mouse on that point just ctrl-drag and that point is moving relative to your mouse. What I'm watching for as I design are making sure my shoulder, knee and heel all clear (don't poke through the shell). When all three of those clear, it's probably ridable. It is pretty anatomically correct (for me) and configurable for anyone of any limb dimensions. Getting closer men, I always draw an analogy to "brain shape" being like "body shape". When you get away from thinking hard it takes a while to get back into shape again, just like our carcasses! If Warren can't post it, I'll see about working my website beyond the default starter page and see I can get it posted out (or use one of the cloud file transfers). This is a paper and pencil concept of a high speed commuter shell. I can post a link to the .wmv later today, or you could just upload it to youtube and post the link to that here. `I am definitely interested It would be good to also have the rider volumes as a separate stand alone output. Depending on the fairing configuration the moving ground plane may not have any effect. Oh yes youtube. I will do that Warren. Despite my software career I have worked on Secret or Top Secret systems isolated from "the world" for the most part. We were always expressly prohibited ... well not actually prohibited but "strongly discouraged" from using ANY social media. We watched horror training films of security breaches via intercepts at the social media level. As a consequence I am virtually illiterate for "all things web". Going to see about getting a better screen recorder first! Dave, I'm not sure exactly what you mean by "rider volumes as a separate...output. Can you clarify that for me sir? This does allow describing the rider to any size or shape, although the actual shapes (confined to two ellipses tied together) might not reflect a spare tire or particulars like that. It does allow the maximum dimension "input" at the waist and shoulders. I quote "input" because, right now, the bike and rider dimensions can't be designed in the GUI it requires manually editing an input file. I worked all morning trying to get this installable. Only made a few .msi's (somebody else prepared all our stuff for releases) in the past but this one is a bit special. At the very worst it'll turn into a manual install whereby the user would have to pull in free SDK (software development kits) from MicroSoft. Then they'd be able to run the software. Although the constants change at the rider box (tail is much more blunt of an airfoil than the nose) all of it is airfoil sections. First installation files are ready and I'm ready for feedback. No shape output to printers nor CNC files yet (hopefully not long though). Mike, I just played with it a bit verifying I had limited the seat height and slide to fairly short distances and torso tilt 0-90 degrees. It's not a big deal to change those but probably I'll add a special option to my unused option menu "Upright Mike's Upright Bikes" or something. Oh, Warren said he's see about providing a link. I have a domain and just played with it a little bit today, www.shookupsoftware.com but it appears as if their ftp doesn't allow msi nor exe's to upload. Could rename it I guess but there should be a way. How do these other guys host executables? Maybe provide a cloud link or something I guess. Get there eventually so much to do and only 8 lives left. Never cease to be amazed at how hard it is to dot the i's and cross the t's for a delivery. I probably installed this 30 times today, tweaking this or that each time. Hold down the left CTRL key and left mouse drag to move the blue buttons around and change the shape. See what that does for you guys, thanks Warren! Again don't forget CTRL+left mouse to drag the shape changing tug points. Ain't nothing wrong with me that a good lobotomy wouldn't fix. Jeff, we have been working on upright fairings on our own thread in this forum for some time but thanks for suggesting it and posting a great photo. Good software that can be applied to a recumbent, upright commuter bikes, or motorcycles is very useful. I just looked at the demo! Wow, this is way better than any CAD system I got to use. I was back to using my French curve and pencils. Thank you Grant! Hopefully output won't be too long. Just a heads up on development. Not sure if anybody has tried the software from here. A couple of my local friends have tried it as unofficial testers. It is a bit yet, released weeks before I normally would with the understanding that "If you play with it, you'll tell me what you need". In the meantime, I started to do the output and thought. You know what, the rider model would benefit from more realism simply because I'm using that rider to decide the exact shape. Also, reporting would help. By that I mean constant updates on cross sectional area (the hole the road runner makes in a mountain) and total length, etc. What I think I'll do is allow print scaling to create models or full-sized. Was kind of thinking about a GI Joe (do they still have those) as a selectable size so one could throw a kid's toy inside just for a warm fuzzy that real people would fit in a real one. Also I played around a bit more with upright stuff. Made a couple of interesting upright shells that "look fast".